In large bowl, break up cookie dough. Stir or knead in 3/4 cup of the graham cracker crumbs until well blended (reserve remaining crumbs). Press half of the dough evenly in bottom of pan to form crust. Bake 13 minutes. 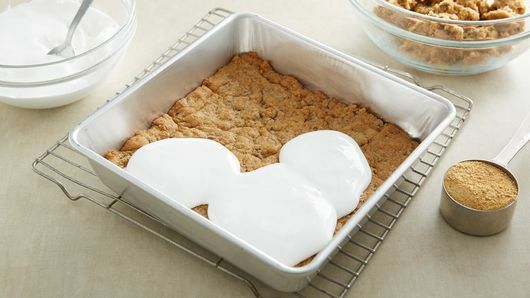 Spoon marshmallow creme evenly over partially baked dough; sprinkle with remaining 1/4 cup graham cracker crumbs. Crumble remaining cookie dough on top. Bake 20 to 25 minutes or until golden brown. Cool 30 minutes. For bars, cut into 3 rows by 3 rows. Serve warm or cool. For a more decadent bar, drizzle top of bar with chocolate-flavor syrup before serving. S’mores are the quintessential backyard dessert, but they can be a hassle, especially when you’re making them for a big group of people. You have to fuss with the fire and then individually roast everyone’s marshmallows and break off pieces of chocolate and graham crackers. 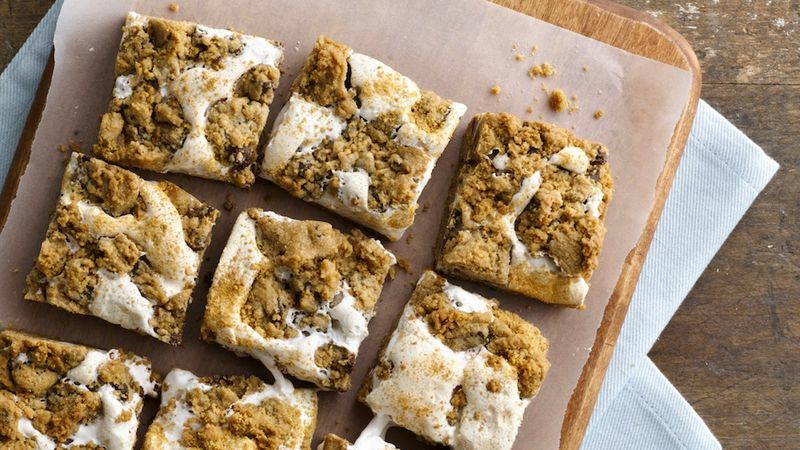 Forget all that and have these gooey s’mores bars ready to go for your party instead. 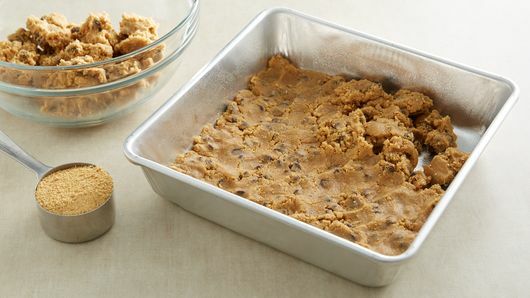 Refrigerated chocolate chip cookie dough gets mixed with graham cracker crumbs to encase the gooey marshmallow cream just like a traditional s’more. Using marshmallow crème is key to making these s’mores bars as regular marshmallows can burn and get hard when baked in the oven. These bars are meant to be a little messy, but greasing your knife before cutting will make cutting them a little neater. And since you can never have too many sweet bars in your life check out these other quick and delicious bar recipes for your next gathering.